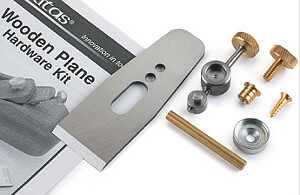 VERITAS Wooden Plane Hardware Kit With this kit (and basic woodworking skills) you can build a bevel-down wood-bodied smooth plane with a Norris-style mechanism for easy depth and lateral adjustment. 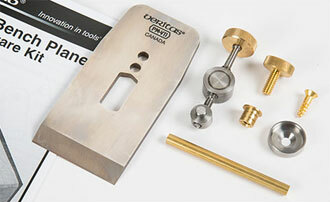 The kit includes a blade, a Norris-style adjuster with a steel cup to seat it in, plus a knob, tapped insert and cross pin for the lever cap, all made of brass. 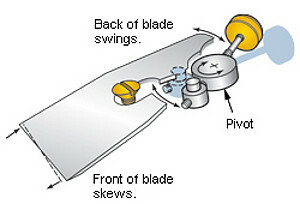 The lapped blade (available in A2, O1 or PM-V11 steel) is 1/8 inch (3.2 mm) thick and 1-5/8 inch (41 mm) wide with a 25° bevel. You provide the wood of your choice; any blank 8 inch (200 mm) x 2-1/4 inch (57 mm) x 2-1/2 inch (64 mm) or larger can be used. Detailed instructions are provided. 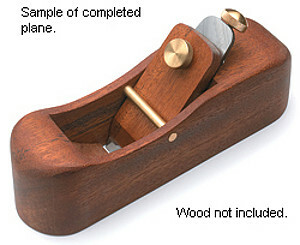 You can customize the size and shape of the completed plane, creating a practical tool that you can use for future woodworking projects. An excellent project for both beginners and experienced woodworkers. Wood NOT included! 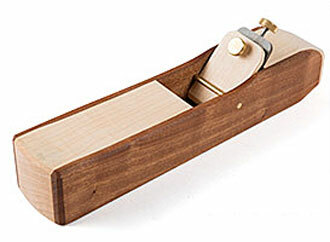 Can be used with the VERITAS block plane blades. Each kit includes a blade and a Norris-style adjuster with a steel cup to seat it in, plus a knob, tapped insert and cross pin for the lever cap, all made of brass. You have the choice of a 2 inch (50.8 mm) wide, 1/8 inch (3.2 mm) thick blade or a 2-1/4 inch (57 mm) wide, 3/16 inch (4.8 mm) thick blade in A2, O1 or PM-V11 tool steel, all with 25° bevels. You provide the wood of your choice (see the chart for minimum blank sizes). Detailed instructions are provided. With PM-V11 Blade Currently not in stock!